The UNCG School of Nursing is proud to announce the recipient of the 2011 Distinguished Alumni Award: Colonel (COL) Michael A. Calder, BA ’75 Biology, BSN ’77. COL Calder is a MHA graduate of Webster University and of numerous military courses and schools with additional certification in Emergency and Critical Care Nursing. He has served as instructor and coordinator for numerous Advanced Cardiac Life Support and Trauma Nursing Care courses and is a recipient of the Legion of Merit, three Bronze Stars, the Expert Field Medical badge, the Parachutist Badge and numerous Army Commendation and Meritorious Service medals. In addition, he was inducted into the prestigious Order of Military Medical Merit, a most noteworthy accomplishment in Army Medical circles. COL Calder has over 40 years of distinguished service to the United States of America and has served at all levels of leadership in the Army Nurse Corps, most recently as the Chief of Clinical Operations, Headquarters Task Force 1st Medical Brigade, Iraq. As the senior Army Nurse in the Iraqi theatre of operations, he ensured sufficient staffing and training for three combat Support Hospitals as well as serving as the clinical advisor on all things medical within that combat zone. A veteran of conflicts in Iraq, Afghanistan, Saudi Arabia, Kuwait and Vietnam, he is the recognized expert in nursing care provision in forward deployments. 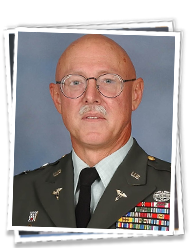 As of February 2011, COL Calder has retired from the Army’s military service to North Carolina. We celebrate and welcome him home!